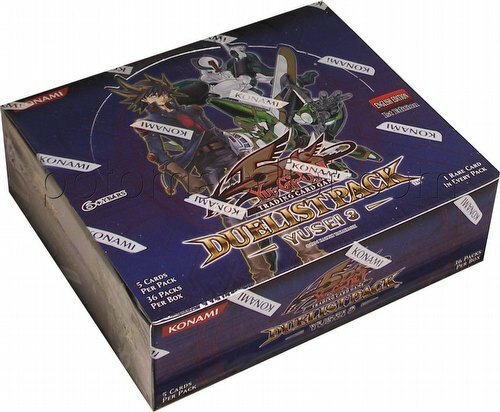 Each $58 box contains 36 packs. Each pack contains 5 cards. 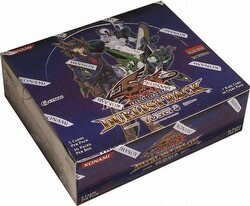 Each Yusei 3 booster pack includes 5 game cards plus 1 strategy card. There are 30 cards in the set, including 8 brand new, powerful cards (4 new Monsters, 2 new Spells, and 2 new Traps), plus 22 of Yusei's favorites. The set consists of 17 common cards, 7 rare cards, 4 super rare cards, 2 ultra rare cards, plus 10 strategy cards.